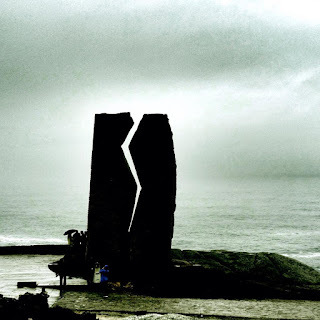 This dramatically-crafted, granite monolith in the coastal town of Muxia honors the Galician volunteers that mobilized in 2002 to clean up a massive eco disaster. That was the year when the Prestige, an oil tanker, was seriously damaged at sea, splitting in two, spilling tens of thousands of tons of oil all along the Costa da Morte, and contaminating sea and sand. The monolith is appropriate named "A Ferida," which translates to "The Wound." On my hiking trip along this coast, following the Camino dos Faros, I was lucky to meet one of the men who organized the volunteers.